started on a project. Luckily there's an app for that! Inspiration 9 includes a collection of helpful visual learning tools designed for brainstorming, organizing ideas, outlining, draft writing, note taking, and storyboarding. Teachers use it to teach essay writing or to have students create their own diagrams for complex concepts, such as outlining the cause and effect of events leading to the American Revolution. The non-linear mind maps they draw with Inspiration symbols, arrows, and pictures help them visualize connections between related ideas. Inspiration's graphic libraries, subject area templates, built-in text-to-speech, spelling checker, and layout arrangement tools reinforce learning across the curriculum, enabling students to focus on what is being taught in any subject without requiring that they read and write large quantities of text. Inspiration 9 builds on the strong toolset available in previous versions by adding new symbols, a Link Phrases labeling capability to clarify how one symbol relates to another, and a tool to lock selected items in place (previously available only with Kidspiration) so that designated symbols and text boxes cannot be moved or deleted. Locked items will come in handy on templates created for students to complete, preventing them from altering the template in unintended ways. For students who want to revise their Inspiration Outlines using a conventional word processor, Inspiration 9 offers support for OpenOffice Writer (Macintosh and PC) and iWork Pages (Macintosh) in addition to Microsoft Word. If you select the OpenOffice Writer option on Macs outfitted with NeoOffice rather than OpenOffice, the exported file (which saves with a filename extension of .odt) automatically opens in NeoOffice. New to Inspiration 9 is a Presentation Manager with tools to help teachers and students create polished slideshow presentations for digital viewing. 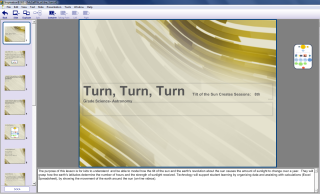 Presentation Manager includes layout themes and can incorporate speaker notes and a title slide if you wish. It resembles Microsoft PowerPoint in the way it lets you create electronic slides containing text and pictures from an Inspiration Diagram or Outline. Other new tools include: 1) a Snapshot utility in both Diagram and Presentation Manager views, so users can capture colorful screen shots for use in the program or in another application; 2) the ability to split or combine topics or convert notes into topics in Outline view; and 3) the ability to insert video and sound clips or record a sound clip directly into a note in Diagram view. Think of the suggestions that follow as features I'd like to see rather than negative impressions of the program. The first time you select "Transfer to Word Processor," it asks you to select the destination application. Then, whenever you choose transfer to Word Processor," Inspiration automatically exports the file to that designated word processor. To change your preferred word processor you must go to Utility/Preferences/Formats and Units, then select the Preferred Word Processor. It would have more appropriate if the Transfer to Word Processor tool did not set a Default word processor without asking me. The Symbol/Lock Item command doesn't apply to Notes, although it does apply to the Symbol attached to the note. Inspiration provides one-button toolbar clicking to flip between Diagram and Outline views. While users may have to make minor adjustments to Outline levels or rearrange Symbols when changing view, these revisions are essentially cosmetic. On the other hand, flipping from Outline or Diagram view to Presentation Manager so that Inspiration automatically generates an electronic slide show requires substantial slide rebuilding and placeholder reformatting. Slide text will have to be moved and often resized for visual appeal. Presentation Manager is indeed a very powerful tool. It works by extracting text from diagram symbols and using that text to create the slides. It also captures snapshots of diagram symbols on a level-by-level and parent symbol/child symbol basis. Users can drag thumbnails of those images from the Presentation Manager gallery onto the slide currently in view. However, inserting an image in this way can easily replace slide text if you're not careful. How would this product be useful in the classroom/school? Teachers who use Inspiration like it for several reasons. They perceive it as a tool to promote active learning because students drag pictures and text-based symbols around the screen to structure information, identify important ideas, and easily connect supporting details. Diagrams allow students to see the "flow" of key ideas and how these ideas are interrelated. Graphic organizers, like Inspiration, present ideas in both pictures and words, linking related key points, visually illustrating the connections and relationships among key ideas, thus making curriculum accessible to a wider range of students. Visual learners appreciate being shown a graphic representation of an idea rather than reading about the idea or hearing it explained. With Inspiration, they will spend less time organizing information and more time making sense of the concepts. They can also use program tools to create supporting graphics for their projects. It's a very useful educational tool with a rich library of symbols to help students put their thoughts down on paper. The interface on the latest version resembles the interface of previous versions, so experienced users can upgrade without missing a point and click. New users will appreciate the wealth of program tutorials and help files. The program has a variety of tools to support individualized instruction for thefull complement of students from high achievers to strugglers. Users can incorporate audio and video elements in addition to Web-links for point and click Internet access. Struggling readers and English language learners can take advantage of text-to-speech, and easily convert a visual diagram into a text outline for revising and editing with a conventional word processor. Would you buy this for your school? Every school should have Inspiration in its software collection. The software supports non-linear brainstorming and higher order thinking for all students, including mainstreamers, high achievers, and struggling learners. This application makes learning interactive. Students can organize information in ways that make sense to them because there are tools to depict ideas in words and pictures and associate pictures with facts. If your school has Version 8 of the application, it's difficult to recommend that you upgrade. However, enhancements available in Version 9 do add new capabilities like Presentation Manager and Snapshot to capture screens in Diagram and Presentation Manager view. Moreover, support for additional word processors, being able to merge or split topics and create new topics from notes in Outline view, and the power to add multimedia elements to notes in Diagram view all add significant value, making it a worthwhile investment for any software library. Retail price: Single copy $69; 5 computer license, $310; 10-computer license, $550; 20-computer license, $895; single upgrade, $29.95. About the Author: Carol S. Holzberg, PhD, cholzberg@gmail.com, (Shutesbury, Massachusetts) is an educational technology specialist and anthropologist who writes for several publications. She works as District Technology Coordinator for Greenfield Public Schools and the Greenfield Center School (Greenfield, Massachusetts) and teaches in both the Licensure program at Hampshire Educational Collaborative (Northampton, MA) and online in the School of Education at Capella University. Send comments or queries via email to: cholzberg@gmail.com.